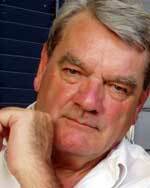 Harry Prior, a US Army veteran, has discovered the books of David Irving, Saturday, March 22, 2008, and thanks God for the Internet. 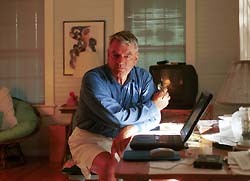 DAVID IRVING writing in 1999 at his rented house at Key West, Florida. I AM devouring your World War 2 histories online every chance that I get a few moments to "dig into them." At the moment, I am working my through HITLER'S WAR. What an eye-opener! This kind of very well researched writing forces one to go beyond the usual stereotyped images in the popular mind. Hitler and gang emerge not as cartoon characters but real flesh-and-blood individuals. Definitely no heroes of mine, but at least I gain some understanding of their motives and deeds. I have already gone through the Goebbels book and the WAR BETWEEN THE GENERALS. And as soon as I get through Adolf Hitler, I will tackle Winston Churchill. I began reading your books before I read anything about you. Thus I judge your writing strictly on its content, not colored by outside impressions of you as the author. Only today as I send this email am I beginning to read about all the controversy surrounding you personally. I just have to resist "stereotypes" of Irving being implanted in my mind. Sticking just to your books so far, I must say that I have gained amazing insights into World War Two through the eyes of the major participants as described by you. My God, man, how the hell did you manage all that research before the advent of the Web? And how did you sustain the enormous concentration that must have been required to put it all down on paper in such clear, readable form? At eighteen, I entered the U.S. Army as the greenest of the green, anxious only to escape hated school. Germany had just surrendered and Japan followed suit in the midst of my Air Force basic training. All I knew was that the two greatest evils, Germany and Japan, had gone down before our noble effort to "save the world." Now, at eighty-one, I have gained so much understanding of what really went on back then that I watch our Iraq involvement with a feeling of utter helplessness. The only saving feature is that no longer do we draft our soldiers. It is all voluntary. It was not so long ago that we had no Internet to go to. Today I cannot even imagine being without it. I would never have seen your books, and much else. Whatever else I may learn about you as an individual from your critics, I have to tell you that your books show me that you are one of the best damn historians around!